Sorious Samura catches shop-keepers selling aid. Where I come from in West Africa, we have a saying: “A fool at 40 is a fool forever”, and most African countries have now been independent for over 40 years. Most are blessed with all the elements to help compete on a global stage – abundant natural resources, a young population and the climate and conditions to be a major agricultural force. And yet today, my continent, which is home to 10% of the world’s population, represents just 1% of global trade. I have no doubt we have to take responsibility for our failures. We can’t afford to keep playing the blame game. But when 50 years of foreign aid has failed to lift Africa out of poverty, could corruption be the reason? Could that really be all there is to it? The symptoms of corruption are easy to spot. Teachers demand bribes from their students because they cannot get by on their wages. 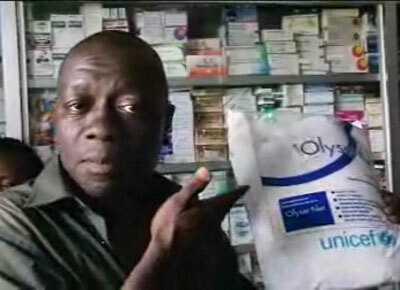 Government officials, doctors and nurses steal drugs meant for their patients to sell on the black market. African leaders have property portfolios across the globe, while their citizens live on $1 a day or less. But searching for the causes, I had to ask myself some difficult questions. People often say a nation gets the government it deserves. And we Africans have certainly made some bad choices in terms of leaders, but all too often Western aid has ended up bankrolling them. Aid has offered legitimacy to corrupt and autocratic regimes, allowing them to hang on to power even when they have lost popularity with their own citizens. While we were filming inside Uganda’s largest hospital, Mulago hospital, these thoughts came sharply into focus. We saw dozens of mothers with their newborn babies lying on the blood-splattered floor next to disposed needles. Victims of road accidents were hauled into hospital by relatives because there are few porters, few trolleys and even fewer ambulances. Some patients were even left to bleed on the floor. These are images I have seen repeated all over Africa and it left me wondering, why we Africans cannot demand greater accountability from our leaders. Why do they keep getting away with this level of neglect? But I was quickly reminded of the proverb taught as a nursery rhyme to African children – he who pays the piper calls the tune. Many sub-Saharan African countries have had high levels of aid dependence – in excess of 10% of gross domestic product, or half of government spending – for decades. When half the government budget comes from aid, African leaders find themselves less inclined to tax their citizens. As a result, governments that are highly dependent on aid pay too much attention to donors and too little to the actual needs of their own citizens. And unfortunately donors have their own objectives which are not always the same as the citizens of African countries. Building new schools and clinics in record numbers looks good on paper and makes politicians look good in front of voters back home. But when these clinics lack the most basic facilities and there are not enough teachers in the classroom, it is the ordinary Africans who get a raw deal. Another criticism of aid increasingly voiced by Africans, but rarely heard in the West is that it sponsors failure, but rarely rewards success. While I was filming in Uganda, local newspaper editor Andrew Mwenda took me and my crew to his home village near the town of Port Loco in the west of the country. There he introduced us to two men, one in his sixties and one aged 26. “This man represents the tragedy of aid,” he said pointing to the older of the two. “While this man represents the potential of aid,” he said indicating the younger man. Mr Mwenda explained that the sexagenarian was the chairman of the local parish council who had spent most of his life living off aid money, supervising projects meant to benefit the community. Today he is an alcoholic who still lives with his mother. The younger man started selling potatoes in the village square at the age of 17. Less than 10 years later he owns the largest and busiest store in the village. He has not received one penny from aid, yet he has bought himself land and has built a house. But instead of funding innovation and creativity, aid has funded the chairman’s dysfunctional lifestyle. Prolonged aid programmes also have wider implications for developing economies. Thirty years of aid dollars flowing into the Ugandan economy has left the country suffering from what economists refer to as the “Dutch disease”. Large inflows of foreign currency push up the value of the Ugandan shilling making its agricultural and manufactured goods less price competitive. This results in fewer exports and less home-grown, sustainable earnings for the country. Local entrepreneurs such as coffee growers and flower exporters should be cashing in on rising food and commodity prices across the globe at the moment, but they are finding themselves crowded out of their own economy by foreign aid dollars. Small African producers also have to compete with heavily subsided products from Europe and North America. Uganda’s cotton industry is capable of exporting almost half a million bales per year, but so far in 2008 the country has only managed 160,000 bales. High government subsidies for North American cotton farmers prevent Ugandan producers from offering competitive prices in international markets. In their glossy pamphlets and on the pages of their high-spec websites, donors tend to wax lyrical about the importance of trade to Africa’s future, yet very little progress has been made on opening up international markets. African producers still represent just 1% of global trade. And at least 70,000 skilled graduates abandon the continent every year, often trained by Western aid, but unable to stay in the market because salaries are so low. Until these gifted and enterprising people can be attracted to return, most of the world’s peacekeeping efforts, on the continent, and certainly most of its aid, will have little effect. Panorama: Addicted to Aid on BBC One at 2030 on Monday 24 November.